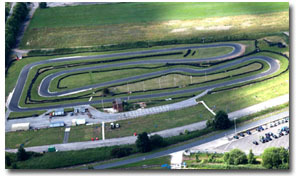 Hooton Park Circuit was constructed in 2006 on the site of the old Hooton Airfield near Ellesmere Port. the track is to R.A.C Motor Sports Association standard and holds race meetings regularly. Various other groups use this facility, such as National Association of Schools Karting (N.A.T.S.K.A), Tarporley Sckhool Kart Club, along with locla authority groups. Corporate Karting was introducted in 2007 and has proved to be very popular, drivers being able to experience the thrills of motor racing without the high cost. Large groups visit the circuit for full corporate entertaining of staff and customers alike. Of course, owner drivers enjoy the use of a proper race circuit for testing, which is available most days. The circuit has the facility to hold A.R.K.S. examinations, should you want to progress to M.S.A. racing.